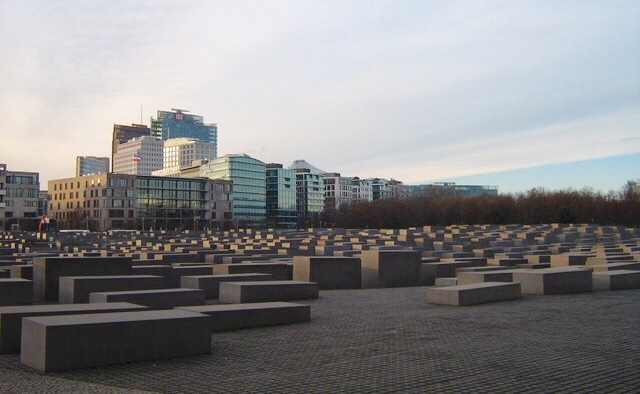 If I start a tour at Brandenburg Gate my next destination is usually the Memorial to the Murdered Jews of Europe, often called Holocaust memorial, which is situated just around the corner. After the classical entrance to the Royal Berlin of 19th century I prefer to continue to what I would call the backdoor entrance to a specific period of German History: The infamous years between 1933 and 1945 and its horrible outcome, symbolized by this memorial. Or to be more precise the way those years are treated and commemorated today. It’s located on the former grounds of the Garden of the Ministries, where most of the important Nazi’s ministries shared an interconnecting garden, during the Cold War times part of the „death strip“ of the Berlin Wall. The memorial is composed of 2711 rectangular concrete blocks, laid out in a rigid grid formation, organized into a rectangle-like array covering 1.9 ha (4.7 acres). This lets for long, straight, and narrow alleys between them. The 95 centimeters (3 ft) between the stelae allow only individual passage. The stelae are each 95 centimeters wide and 2.375 meters (7 ft) long, with heights varying from zero to 4 meters (12 ft). Along with the undulating ground it causes the effect that you feel to sink in it the deeper you go. It was inaugurated in May 2005, exactly 60 years after the end of World War II, and was financed by the Federal Government at the cost of 27,6 million Euro. The plot of land, which was also donated, had a value of 40 Million Euro at that time. The main speciality of the memorial is its openness for individual interpretations. As an artistical work it could be described as an environment – an art installation people could walk through, to bring them into deeper contact with the artwork instead of just standing in front of it. Everytime I’m there with guests, telling them that nobody ever figured out the concept behind the design or particularly the number of 2711 stones, people start to think of it, developing ideas, impressions, interpretations. Without visitors the memorial would be nothing else than a big field of stones – without a meaning. But as long there are people in it, thinking about it, the memorial is alive. And as long the memorial is alive, so is the remembrance of the victims. It needs us to remember and to reflect. Mr. Eisenman, born in 1932, a renowned architect, who was a member of the „New York Five“, never explained his concept explicitly. Why he built a field of nameless stones of that number was in effect never revealed. But he commented on his intentions and described ideas he obtained while observing visitors in the finished memorial. 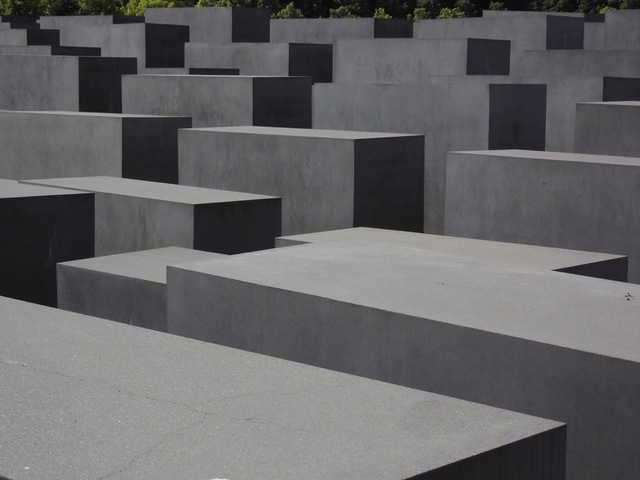 Recently I read an interview in a German magazine, where Peter Eisenmann uttered that the memorial is a place without information, because the worl is already too full of information. Besides that he underlined that his work is intended to be for the German people and not for the Jews. He thinks, it’s a strong gesture of the Germans to situate something in the centre of their capital that reminds them of the past. Finally he gave a personal example for the general connectivity of the memorial for individual ideas. While he watched people walking into it for the first time he saw their heads dissapear. Therefore he found himself remembered by a passage from a book of Primo Levi about Auschwitz, he had read just a short time ago: Levi wrote that the prisoners were neither alive nor dead. Rather they seemed to descend into a personal hell. Nearly everybody was impressed of its power and experienced the unique concept of interaction and openness: Children are allowed to play hide and seek there, if they like to. Nobody is forced to feel or think in a prescribed or somehow appropriate way. And nearly everybody immediately started to think about the concept, trying to be the first who really figured it out. Always I’m there on a tour I ask my guests to share there ideas. Therefore I heard so many fascinating and sometimes very personal ideas during the last ten years. 1.) In a big group of adults, excitedly discussing the hidden meaning behind the number of 2711 stones a six year old girl asked about he number of the little cobblestones on the ground: „Maybe there are six millions and nobody is noticing them, while walking on them?“ That night I came back and counted the cobblestones from two sides before multiplying them. I forgot the result but it was way less. Nevertheless that little girl asked a very smart question! So – what will you think? Come to Berlin, do a tour with DriverGuidesBerlin and experience that incredible place! • While the memorial is revealing absolute nothing about its purpose, a Place of Information is attached in the underground. The exhibition is divided into four rooms dedicated to personal aspects of the tragedy, for example the fate of selected individual families or letters thrown from the trains that transported them to the death camps. In the „Room of Names“ names of all known Jewish Holocaust victims obtained from the Yad Vashem memorial in Israel are read out loud. Each chamber contains visual reminders of the stelae above: rectangular benches, horizontal floor markers and vertical illuminations. • Topography of Terror – a very imformative exhibition on the former grounds of the headquarters of the „SS“, the „GeStaPo“ and the „Reichssicherheitshauptamt“, unfolding the operating modes of those institutions, which were responsible for the fulfillment of all the Nazi terror. • Haus der Wannseekonferenz – exhibition in a former SS guesthouse, where in 1942 during a breakfast meeting 15 senior government officials and SS leaders confirmed the realisation of the so-called „Final solution to the Jewish question“. • Track 17 – commemoration site on Berlin-Grunewald railway station, where most of the deportation trains from Berlin started.